E! has an awesome picks reward for guys and girls! Girls..this beautiful white sweater is a perfect addition to your winter wardrobe! Great to dress up with the Christmas accessories the Freebie Telegraph has been blogging about lately. There is also a great white sweater for the guys too! Perfect for those upcoming holiday parties! Recently, holiday related group gifts have been sent out. One from Roule, and another from Vanity Hair. Well, after cramming for finals and outrunning a storm to my family out of state, I finally put something together for the holidays: two sculpted evergreen trees with copy/mod rights so you can make them your own. The L$1 tree comes with a texture change tree skirt and stands ready for your own ornaments and garland; the L$10 tree has the texture change skirt and texture change decor. The hanging orbs have 5 different colors, the star has 6 (3 silver tones, 3 gold), and the skirt has too many for me to recall. None suiting your taste? Just edit the linked parts and drop in your own textures! Too many prims? Not enough? Edit to your hearts content with the copy/mod settings. Casey’s Creations which makes amazing costumes is having a 10 days of Christmas giveaway to all of their group members. Best part is if you have missed the first few days they are boxes for guys and girls of all the past days presents, how cool! Thank you Casey for being so very generous! Hugs! 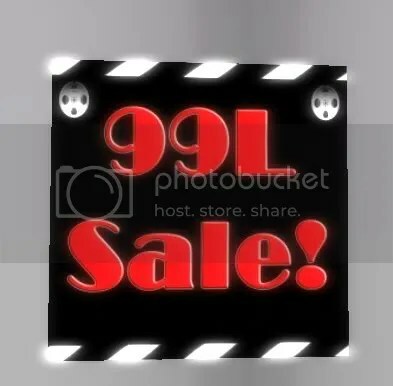 Plus check out the 99L sale on select costumes, very cute!